We compare the option of a director nominating an alternate director in contrast to nominating a successor director in a self managed superannuation fund (‘SMSF’) context to determine which is better. In Part 1 of our series, we considered how alternate directors are problematic in an SMSF context. In Part 2 of our series, we examine how successor directors are the much better tool to use. We provide a brief comparison table below to support our view that alternate directors are not of much use in an SMSF and indeed can give rise to a number of risks; especially from an SMSF succession planning viewpoint. Note that, for simplicity, we discuss the role of an alternate or successor director in the singular below even though in practice there may be more than one of these acting at the time. What is a successor director? A successor director is a special mechanism included in a company’s constitution whereby a director is empowered to appoint one or more other people who actually step in as fully fledged directors when the first director loses capacity or dies. Special rules in the company constitution are needed to implement successor directors. How do you appoint a successor director? The Corporations Act 2001 (Cth) (‘CA’)provides for an alternate director role but is silent on successor directors and in all likelihood most constitutions are as well. The appointment of a successor director therefore requires special provisions to be included in the company’s constitution. These provisions require careful drafting to ensure they are clear, effective and balanced in how they operate in practice. If a constitution is silent on successor directors the shareholders of the company can pass a special resolution plus satisfy any further requirement if specified in the existing company constitution to vary the constitution or adopt a new constitution with the relevant successor director provisions(refer s 136 of the CA). Once the successor director provisions are in the company’s constitution, the appointing director can appoint their successor director in line with those provisions. DBA Lawyers’ constitution, in addition to including successor director provisions, provides a pro-forma successor director nomination form for each director to nominate their successor director.Naturally, the successor director must consent to their appointment. It is important to note that successor directors do not automatically mean a fund will continue to be an SMSF. Generally, to fall within this definition, each member must be a trustee or a director of the corporate trustee of the fund. However, the Superannuation Industry (Supervision) Act 1993 (Cth) (‘SISA’) allows a fund to still meet the definition of an SMSF in certain other circumstances, such as where a trustee or a director of the corporate trustee is a legal personal representative that holds an enduring power of attorney in respect of a member of the fund. Further, an executor can represent a deceased member as a trustee/director under s 17A(3)(a) of SISA. Jacob and Rachel are SMSF’s directors with one share each in the trustee company and the only two SMSF members. Simon is the adult son of Jacob from a previous relationship and has been appointed Jacob’s alternate director. As an alternate director, Simon would be able to attend board meetings on behalf of Jacob and have the same director’s powers as Jacob. Jacob also appoints Simon as his attorney under an enduring power of attorney. Rachel also has a daughter from a previous relationship, but the daughter is not involved in the SMSF. Jacob ultimately wants Simon to take over as a director when he dies or loses capacity. Years later, Jacob becomes mentally incapacitated and as a result ceases to be a director since the constitution of the company states that the office of the director becomes vacant when a director dies or becomes mentally incapacitated. As discussed in Part 1 of our series, when Jacob loses capacity Simon would cease to be an alternate director. However, if the constitution is appropriately worded, Simon as attorney under the enduring power of attorney can exercise the power attaching to Jacob’s shares and seek to appoint himself as a director of the corporate trustee. Note that an attorney under an enduring power of attorney cannot simply act on behalf of a shareholder who has lost capacity –see Cordiant Communications (Australia) Pty Ltd v The Communications Group Holdings Pty Ltd  NSWSC 1005. Generally to be appointed as a director, the constitution requires the consent of the majority of shareholders. In this case, since Simon has one share (ie, Jacob’s share), he will need Rachel (ie, Simon’s step-mum) to consent to his appointment to have a majority vote. Rachel may not wish to consent to this appointment. If Jacob appointed Simon as a successor director then Simon automatically becomes a director in place of Jacob under the specially worded constitution without any need to get Rachel’s approval. Simon should still be Jacob’s attorney under an enduring power of attorney and executor under his will so that the SMSF would still fall under the definition of an SMSF under s 17A of the SISA. Although alternate directors may be a useful tool where an appointing director may be overseas or may want their alternate director to act for them when they are unable to attend a directors’ meeting, they have limited flexibility. One of the major downsides is that an alternate director can only act where the director continues to have capacity. If the director has lost capacity, the alternate director can no longer act for that director. The main issue with alternate directors is that, broadly, depending on the company constitution, an alternate director appointment ceases when the appointing director ceases to be a director. In terms of succession planning, the whole point of appointing a successor is so that the successor can step in immediately when the relevant director checks out. Under many constitutions, a director is removed when they lose capacity. Moreover, if a director dies, an alternate can also no longer act. Thus, an alternate director offers limited flexibility for succession planning. Naturally, prior planning is required to ensure the relevant documentation is in place to appoint a successor director. An alternate director can be appointed in accordance with s 201K of the CA which is a replaceable rule. A replaceable rule under the CA can be displaced or modified by the company’s constitution. Thus, the company’s constitution can set out more comprehensive provisions, for instance, in relation to alternate directors than what is provided in s 201K of the CA. As discussed above special provisions are required to be added to a constitution to provide a successor director role. Accordingly, a successor director role provides greater flexibility and is more suitable for succession planning. Not only will a successor director appointment achieve the goal of having a director’s successor step in when they lose capacity or die, it also enables the appointment to occur without the required approval of other shareholders. It provides more certainty of the desired person taking the place of the director at the relevant time. Note that once a successor director is instituted, a majority of shareholders could then remove a director including a successor director. However, in many tightly held companies such as many mum and dad companies with only two equal shareholders, this is not possible without one spouse controlling a majority of votes. The table below provides a brief summary on how alternate directors and successor directors are different. Naturally, like all good succession planning, a regular review should be conducted to ensure everything is still appropriate at least every 3 years. As you will appreciate from the outline provided in our two part series, the appointment of an alternate director has limited flexibility and value from a succession viewpoint; especially as an alternate director ceases upon an appointing director losing capacity. 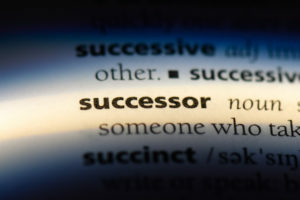 In contrast, a successor director mechanism provides greater flexibility,succession to a director’s role and is more suitable for succession planning. Note: DBA Lawyers hold SMSFCPD training at venues all around Australia and online. For more details or to register, visit www.dbanetwork.com.au or call Marie on 03 9092 9400.